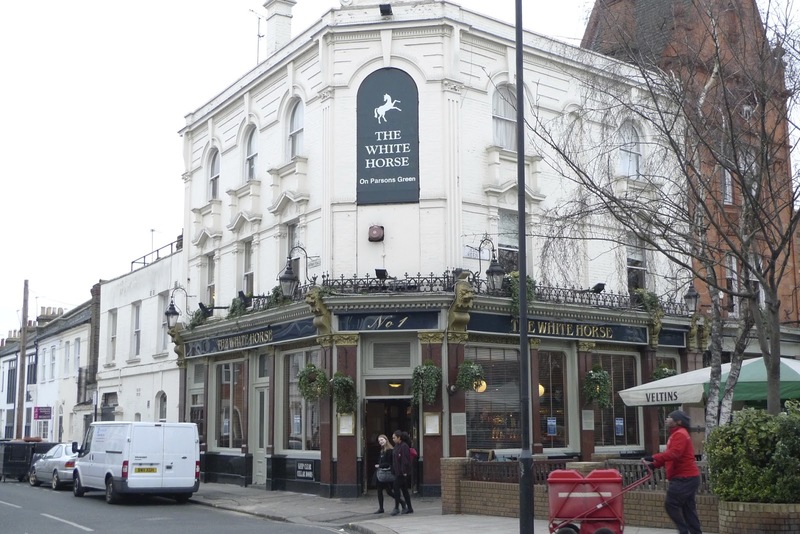 Anticipation was the key word for our planned visit to the White Horse in Parson's Green on our recent London trip. I had been reading the wine, beer, and food menu's on the pub's website for a couple of months prior to our visit. What a concept; a gastropub on the edge of a leafy green, well rounded wine list and a stellar line up of draught and international beers paired up with regional and national ingredients on their food menu. Following a short walk from the tube, the area has a slight rural feel to it like Hampstead, we came across The White Horse. The pub has Victorian feel with an interior of rich mahogany paneling, flagstone and oak flooring, comfy and well worn leather seating, a warming fireplace along with nooks and snugs to drink and nibble in private along with a full dining room and bar seating area. 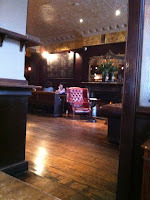 The White Horse has had the nick name of the "Sloaney Pony" for its Sloane ranger clientele. On our lunch visit it was a mix of local professionals and a handful of tourists. With 30+ wines by the glass and a nice balance of old and new world varieties and a well thought out selection of aromatics that work well with the cuisine the wine list gets a nod for one of the better pub lists. The list looks heavy from the Adnams portfolio which would also account for a number of the beers from this brewer and retailer. Draught and cask ales make up at least a dozen selection options along with "based on their website" a 100+ bottle selection of international beers with a great variety from Belgium, Britain, and the USA. I never did see the extensive bottled beer list even after asking not only my server but two bartenders for it! Where this pub failed and it failed horribly was service. My wife and I arrived just shy of 1pm for lunch and a pint and a glass of wine. We ordered a couple of pints at the bar to start, leaving our credit card details for a tab, and then sat and sat for 20 minutes before we were given menus and asked for a food order. Surly service, no keen passion to sell the menu and little interest in offering me wine or beer suggestions or even a drink list. For starters I opted for the venison carpaccio. Delightfully tasty with heirloom tomatoes, grilled thin asparagus, and a grainy mustard crust. This was perfectly paired with a glass of Dry Creek Chenin Blanc with a perfect balance of acidity with the tomato and mustard. An English wine either sparkling or an aromatic (Bacchus) would be a nice drink list addition. My mains was a Black Pudding Crusted Pork Loin with glazed Brussels Sprouts, and pearl barley. A hearty lunch option on a chilly day in February, the pork was slightly overcooked but nonetheless very well excecuted . The Duchess de Bourgogne, a Flemish red ale, with sweet/sour acidity, hints of oak, balsamic, and brett paired extremely well with the pork. The White Horse is the only pub that I have seen this amazing beer on draught. After the starter and mains we were too full for a pudding course but the selection looked wonderful especially with their selection of pudding wine selections or a fruit lambic. 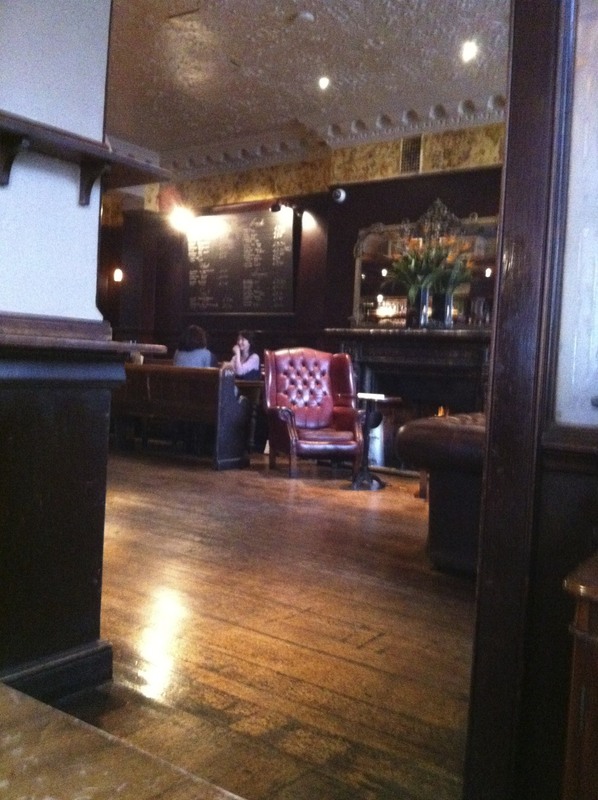 The White Horse is a lovely pub and I will have to return for their outdoor BBQ and beer festivals in a future visit. Ambiance, patrons, and drink selection gets high marks. Service FOH does need a lot of work. Lack of guest skills, table service, and lack of interest in the food and drink ruined our overall experience. When I have to order a drink using my iPhone to look up their wine and beer list on the website it makes you wonder why they have service staff. After three attempts with three staff members to get drink menu's it was complete service fail.